A happy belated birthday to Art McGinnis who turned 90 recently. His daughters, Susan Burk, Sylvia McGinnis and Sandra McGinnis, threw a party for him at the St Francis Barracks where he and his wife Lorraine enjoyed family, friends, food and a fantastic belly dancing presentation! Congratulations to Isabelle C Lopez, Assistant City Attorney for the City of St Augustine, for being honored by 904 Magazine from Jacksonville as one of the top attorneys in the Jacksonville area. Martindale-Hubbell, a peer review service, conducted the ratings and you can see them all at JacksonvilleMag.com. Just in time for holiday shopping, Olde Towne Toys has opened at 113 King Street (immediately next door to the old Hamblen Hardware). The focus of the shop is on fun, educational and unique toys not found in large department-style stores and some of the brands are Corolle dolls from France, wooden toys from Germany, Quercetti products from Italy and a host of arts and crafts kits, doll houses, kitchens, plasma cars and other great stuff. Priced competitively, you’ll want to check out the goods and owner, Jennifer Ellen-Ellis, is working on fun events for kids. Stop by and welcome her to the neighborhood. John Powers, owner of the popular St George Street shop, Dragonflies, at 142 St George Street, has opened Serenity Blue at 102 St George Street (corner of St George and Hypolita Streets). Nautical in nature, with a beach cottage vibe, the ambiance of the shop is the perfect environment for John’s vision. Taking great pride in creating fresh and exciting displays, each piece of jewelry here has been carefully handcrafted by local artists and some of those artists assisted in the crafting of the shop’s interior. Not a franchise or a chain, this independent store highlights the vibrant entrepreneurial spirit of its owner and of the St Augustine community at large. Be sure to visit this new face on the street. 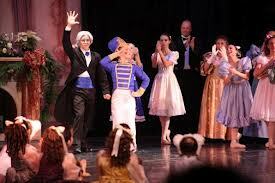 Christmas is right around the corner so it must be time for The Nutcracker and indeed it is. The Saint Augustine Ballet will have three performances this weekend with a 2pm matinee both Saturday and Sunday, December 15 and 16, and an evening performance at 7:30pm on Saturday. Being held in the newly renovated Lewis Auditorium at Flagler College, 14 Granada Street, this holiday favorite has a multigenerational cast of 88 dancers. With guest artists, Alyson Pray from the Pennsylvania Ballet and Ballet Fleming, Yosbel Delgado-Hernandez from the Pennsylvania Ballet and Orlando Molina who teaches at the Center for Dance Education at Atlanta Ballet. Local celebrities in the cast include: Tommy Bledsoe, Jerry Dixon, Georgia Garrett, Todd and Katherine Battenhorst, James McCune, Chelsea Hilding, Joe and Jane Boles, Luis Abella and Carol Carnicelli. Call 824-1746, visit saintaugustineballet.com or email tickets@saintaugustineballet.com for tickets and information. The St Augustine Community Chorus will be presenting Christmas Reflections at the Cathedral-Basilica at 38 Cathedral Place this Saturday and Sunday. Saturday’s show starts at 7:45pm and the Sunday matinee at 1:45pm. Don’t miss this musical event with guest soloist Jim Goodell accompanied by the Jacksonville Concert Artists. The St Augustine Children’s Chorus will also be performing. Tickets can be purchased at Cathedral Bell Tower Shop, Music Matters, Herbie Wiles Insurance, CNL Bank First Coast, Anastasia Books, Southern Horticulture, Flowers by Shirley and Carter’s Jewelry or at staugustinecommunitychorus.org. Jan Miller of Butterfield Garage has two important announcements to make. The first is to welcome Beau Redmond back to the Butterfield Garage Art Gallery. On sabbatical for the past four years, Redmond returns even more inspired, if you can imagine that! One of the founding members from 1999, he is excited to be back among old friends and new artists. Jan wants to thank all the local patrons and visitors for their continued support over the past 13 years and in that spirit, the Gallery is hosting an open house on December 19 from 5 to 9pm where thanks and the spirit of the season will be on full display. Drop by – the current show is vibrant and diverse, as is the company. Jennifer Tesori, Youth Advocate and Community Liaison at the The Players Championship Boys & Girls Club of St Augustine, reminds us it is not too late to brighten a child’s spirit this holiday season. Many of the children served by the Boys & Girls Club of Northeast Florida will not be receiving gifts and you can help. Courtney Weatherby is spearheading the project and you can reach her at CourtneyW@bgcnf.org. Saltwater Property Group is a downtown drop off for canned goods and non-perishable food for pantries of both St Francis House and Pie in the Sky in Hastings, so if you have a donation, please drop it off at 81 King Street, Suite B (right above the Bank of St Augustine). Visit hastingspieinthesky.com. This is also the drop off for Sertoma’s Toys for Tots. All toys are distributed to children in St Johns County and we welcome your donations. Pickup is December 19th, so get your toys over as soon as possible. Finally, congratulations to St Augustine for being recognized as a must see place in 2013 by the National Geographic Traveler Magazine. We’re shoulder to shoulder with some fine national and international company and this is quite the honor for us all. Dust off your ambassador’s hat! Warm wishes for a good holiday to all.